we have in stock- Notre Dame posters from Chatham Fine Art,Everlasting Images, jerseys, vintage collage, Lou Holtz, Ara Parseghian, Dan Devine, Knute Rockne, Charlie Weis and others. Joe Theisman, Rudy, Joe Montana etc. call us or stop in. Our inventory of signed memorabilia changes frequently. We also carry Winning Streak and other vendors items. We also carry the "Rudy" movie poster.If we don't have it- we can find it for you. We don't list everything that we carry here for competitive reasons. 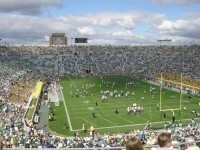 If you come visit us, we will have the BEST selection of hard to find Notre dame Banners-Photos-Signed items. we have in stock Colerain, St X, Elder, Lasalle, Anderson. Lakota East and West, Fairfield, Taft, Walnut Hills, Mariemont, Moeller, Kings, Milford, Loveland, Sycamore, Princeton and many more. We take requests for any local high school and continuously update our lists call us at 513-489-3400 to order yours today!